WEST HARTFORD, CT- The Providence College Friars came down from scenic Rhode Island to take on the Hartford Hawks Friday night. For the U of H it was senior night, as the last home meet honored four seniors, Michelle Cordell, Danielle Etta, Lindsay Makowicki, and Sydney Scott who had all made numerous contributions to the team throughout their careers. Cordell and Etta are starters in the 2011 campaign but Makowicki and Scott got plenty of playing time in the past few years as well. Once the ceremonies had passed it was time for business and the Hawks sent their seniors off with a 3 set win over the visiting Friars, 25-20, 25-22, and 25-21 for the sweep. Set 1 opened with Providence leaping out to a 6-2 lead thanks to a service ace from Shelagh Dolan, a kill from Lauren Hendel, a set attack from Carly Morrison, a service ace from Hendel which hit the net and dropped in, a tap over the front line by Lauren Fletcher, and another service ace by Morrison, a rare case of 3 service aces, by 3 different players amidst the team’s first 6 points. Hartford fought back with a smash from Kami Nethersole, and Taylor McCreery and Lindsay Anderson shared two blocks in a row, including one that absolutely stuffed a PC attack, Sareeta Nethersole then tied it up with rocket into the defense’s zone. A jumping smash from Fletcher following a Hartford point would tie it up, but the Hawks took the lead and held it through the rest of the set. Anderson teed up an attack which hit a Friar and smashed into the side wall, a few points later, Dolan unleashed a big spike, but following a good defensive save to keep the ball alive by McCreery she ended up with the ball and sent it to the corner. Hendel responded with a spike off a mid court defender’s out stretched hands, but Cordell then hacked the ball off the blockers and to the floor, and Kami Nethersole typhooned it into the PC zone. Hendel and Dolan shared a block, but Kami Nethersole struck again. A few points later Jackie Tamburri sent an service ace over and in for another Hartford point. Fletcher’s block kept her team within 3, but Kami Nethersole would soon be launching another shot in, Anderson would add another, and Etta got in on the offense when her service ace dropped into a corner. Dolan crushed an attack amidst the Hartford scoring, but I twas soon 20-15 Hartford. The two teams traded some more points including a cross court spike from Hendel, and Tamburri served it right to Cordell who unleashed a thundering spike. Morrison responded for PC, but Kami Nethersole found a gap to slice the ball into. A Hartford service error, and two straight blocks from Fletcher and Coleen McCollom led to a Hawks time out but when play resumed Kami Nethersole and Anderson shared a block, and Anderson finished off the set with a kill that spiraled over and in for the 25th point. Set 2 was a close one to start as each side volleyed to a 6-6 tie, but then Hartford built another lead and clung to it, fending off a Friars comeback in the late going. Providence points included an opening kill from Hendel, a block from Morrison and Fletcher, another block from Fletcher and McCollom, later Fletcher would pick up a spike, as would Dolan, who would add another, before Hendel put down the ball at the net, and Dolan served up an ace. Later on Hendel sent a serve speeding over which the defender’s dig could barely get a piece of and it landed in for an Ace, Fletcher added to her kill total with authority, and teamed up with Anna Russian for a block, Russian had a whap of her own late in the set, and Hendel smacked the ball off the blockers as well, soon after she added another, and McCollom also sent the ball rebounding off the blockers during a late charge. Offense for the Hawks included Cordell spiking the ball off a defender and out of play. She then stepped back and served up an ace, Kami Nethersole sent the ball off the blockers and straight to the floor, McCreery also smashed one off the blockers and sent it flying sideways, Sareeta Nethersole added a kill, and McCreery another, Cordell put down an errant Providence pass, and Kami Nethersole delivered another kill. After a Providence scoring drive, Cordell’s huge titanic spike broke it, and Tamburri and Anderson came up with a block on the following back and forth. Mid-set Tamburri redirected an out of control teammate’s dig and kept the ball alive leading to an eventual point, Sareeta Nethersole received a set and lined it up for full effect, Tamburri’s fake set attack worked after not catching Providence off guard in set 1, McCreery followed this up with a huge blast, Cordell crushed an attack of her, and Kami Nethersole added to the forceful attack storm, adding a cross court blast into the corner right after. Following a PC point, Tamburri received a teammate’s dig and redirected right in for a point, after a brief comeback by Providence, Hartford regained a two point advantage and McCreery ended the set with a kill. Set 3 began fairly evenly with each team reaching a 12-12 tie. The Friars grabbed a two point lead, only to see 7 to 0 run put the Hawks up 19-14. Points up to this point came from Hartford in part from Cordell’s big kill to open the set, Kami Nethersole using a set to line up a killl, Anderson kabonging a spike off the blockers, and later a cross court whap from Sareeta Nethersole, a few points later Tamburri caught the D with another fake set, and McCreery blasted it over to follow, Tamburri added another rkill mid-set, and Anderson tied the set at 12 with her corner shot. 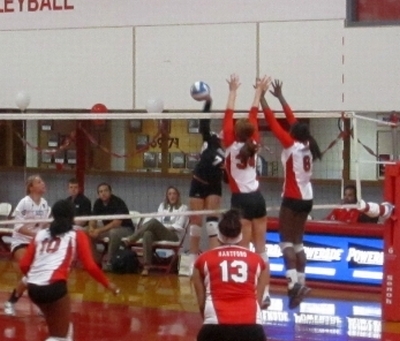 During Hartford’s lead taking run, Anderson had two more in a row and the Hawks picked up a block as well a kill in which Kami Nethersole sent the ball off a defender and up into the ceiling, the ball hit hard and smashed back into the floor, Anderson and McCreery also teamed up on a block as well. 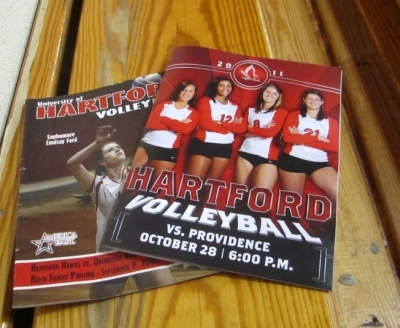 PC’s Morrison broke the Hartford run with a fake set attack, but two straight smashes from McCreery blunted that. Dolan’s light attack, and a rocket to the back court from Hendel were part of Providence’s comeback effort, though Tamburri served Cordell and the Hawk senior launched it over with a hard smash to make the score 23-17. Makowicki came in to serve at that point to great ovation, making her the fourth senior to play, as Scott had rotated in earlier in the match. Hendel picking up another point for Providence with an attack just in bounds and a Hartford attack out of bounds narrowed the lead to 23-19, but Cordell at close range richocheted the ball off the visitors and out of play. Providence picked up two more points however, but with the match continuing to be on the line Cordell ended it, set and match. Hendel led Providence with 8 kills, Fletcher had 6 kills, Morrison and Dolan had 4, Russian 3, and McCollom 2. Morrison had 21 assists on the day, and Cassie Muzzonigro had 10 digs. Fletcher had 2 solo blocks and participated in 6 others, with McCollom taking part in 3 and Morrison 2. Dolan had 3 service aces on the day, and Hendel and Morrison each had 2. For Hartford, Kami Nethersole and Cordell had 11 kills each, McCreery had 9, Anderson 7, Sareeta Nethersole 5, and Tamburri 4. Tamburri notched 36 assists on the day, and she and Kami Nethersole led the team in digs with 9 a piece. Etta and Dionna Kirton platooned at libero with Etta in set 1, and Kirton in set 2 and 3. Sareeta Nethersole and Anderson each had a solo block, but Anderson took part in 5 others, Kami Nethersole 3 tandem blocks, and McCreery was part of 2. Tamburri, Cordell, and Etta had the 3 service aces the Hawks put up during the match. Hartford’s overall record rose to 12-14 and 3-5 in the America East (all the more important in the quest for tournament seeding.) Providence dropped to 7-18, and 1-6 in the AE. Editor’s Note: This is based on notes taken at the match, verified against the official play by play if possible. (Official Sports Information Box Score as released by can be found here.) Reports focus on offense since it is easier to track but note defensive play whenever possible. It is difficult to note things like digs and assists although they are no doubt vital to the game. Also, a lot happens in a volleyball game, far more than can fit into a report, so this just notes some of it.